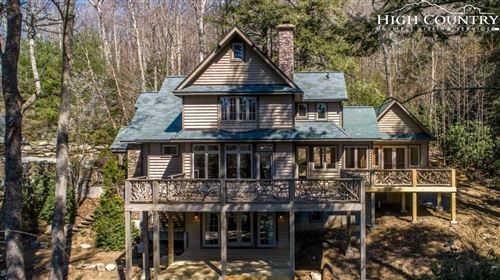 Gracious Linville Ridge contemporary mountain estate offers a wooded location and sunset mountain views. Almost 4 acres, gardens and waterfall into koi pond enhance the secluded attributes of this 5 bedroom, 5 1/2 bath home. Porte Cochere and inviting main level foyer lead to the open great room with stone fireplace, vaulted ceiling, large windows, wet bar, large dining area. Designed for a natural flow of hospitable entertaining. Main level also includes the Master bedroom, private bath and exceptional closet spaces; second bedroom used as an office; library; laundry room with storage and workspace; oversized 2-car garage. The kitchen is the hub and gathering place. Expansive windows bring the feel of nature inside and spacious decking beckons to relax or entertain. Lower level includes 3 bedrooms each with en suite bath, spacious playroom area with bath; second laundry room with refrigerator, 3 large closets off wide hall with built in shelving. Circular drive, additional parking give easy access. First time on the market and ready for an appreciative buyer who wants to add personal touches. Offered unfurnished. Furnishings, inside and outside artwork and sculptures negotiable.